Two Bath Academy students, Alexander Ukwu and George Merison received CIFE awards from CIFE President Lord Lexden at the 2015 CIFE Awards ceremony this March. Alex received the Paul Kitchener Award for best Foundation Course stsudent, and George received an award for outstanding contribution to college life. Alex Ukwu came from Hamburg to join Bath Academy in September 2013, after completing his secondary education at Loyola Jesuit College in Abuja – a leading Nigerian secondary school. He completed the West African Secondary School Certificate with exemplary grades. He immediately impressed his teachers in Bath with his very positive attitude towards his studies and contribution to the life of the college from his arrival. He was exceptionally hardworking, conscientious and consistent in his determination to study Electrical Engineering at university. In fact, if he did not achieve top marks in a test he would be beside himself. He scored straight A grades on all six units of the University Foundation Programme averaging 92%. 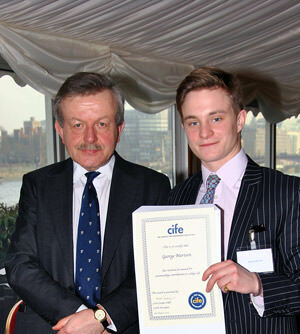 Before coming to Bath Academy George Merison (pictured receiving his Award from CIFE President Lord Lexden) had spent a year in the Utah desert and in Western Samoa, where he undertook a number of character-building experiences. However, this meant that he needed to complete his A Levels, which he did in just over a year.